I’m not exactly a fan of apes. When the first reboot came out in 2011, followed by the second instalment in 2014, I naturally skipped them, ignoring the positive reviews. Well, this was going to continue for the third, until Twentieth Century Fox sent an invitation to catch the preview. I went half-hearted, partially because Peps was held up with his theatre rehearsals and couldn’t make it for the movie. Without any prior knowledge of the past two films, I enter the theatre thinking it was going to be another Kong: Skull Island. Well well, War for the Planet of the Apes was much more than just that. I was impressed, I didn’t have trouble picking up the story even when I’m watching with fresh eyes. It felt amazing how the CGI apes were able to communicate with the audience (not just one another!) through their intrinsic expression and body language. The themes were clear and yet so contradictory. When the decision between survival versus morality, human versus ape, good versus evil come into play, the war was not just between the 2 species, but also within themselves. Watching drunkard Haymitch from The Hunger Games and Merritt, one of the horsemen from Now You See Me turn into an iron-fisted and somewhat psychotic Colonel was unsettling. He did his job well, that “I-Did-For-The-Greater-Good” justification made his motive so understandable that I could see myself rooting for this heroic antagonist if the tables had been turned. However, when it comes to Gabriel Chavarria’s role as Preacher, the soldier (on the right) serving the Colonel, I was a tad disappointed. He had so much screen time and potential to be the only human amongst the brainwashed masses who still had some conscience left, but nope, the character let me down. Innocent Nova (Amiah Miller) was astounding in her wordless performance, the only sweet young human left, partly because she was an infectious outcast. Human society seem hopeless, and it wasn’t difficult for me to buy into the idea of wiping the entire population. Andy Serkis’s Caesar silent interaction with her went from suspicion, hostility to pity, trust and it made her look more like a fallen angel than a mute human. Steve Zahn’s appearance as ‘bad ape’ (Yes, that’s the original Frank Heffley from Diary of a Wimpy Kid) is probably my favourite part of the film. He provided the much needed comic relief to the otherwise grim story line, and there were moments where I nearly want to do a “Awww” to this E.T. like talking-ape. I was glad that I got to watch the movie, and it pretty much convinced me to catch the first two from the start! In the first film, Rise of the Planet of the Apes (2011), Caeser could only utter a few words, most notably “No!” In the second film, Dawn of the Planet of the Apes (2014), his vocabulary had greatly increased, able to speak in nearly full sentences with syntax and grammar, but still with a rough tone and cadence to his voice. In this film, he is able to speak nearly identical to what a human can produce, indicating his growth into personhood. Andy Serkis, Terry Notary, and Karin Konoval are the only actors to be in all three of this Planet of the Apes trilogy. Serkis plays Caesar, the chimp leader of the apes; Notary plays Rocket, a chimp who is one of Caesar’s most trusted followers; and Konoval plays Maurice, an orangutan that is another of Caesar’s most faithful followers. Ape actors Andy Serkis (Caesar) and Terry Notary (Rocket) have also both played King Kong: Serkis in Peter Jackson’s King Kong (2005) and Notary in Kong: Skull Island (2017). According to director Matt Reeves, the apes that serve the humans are called “Donkeys”, both as a reference to Donkey Kong and like donkeys, they are used as pack animals. Andy Serkis, the voice of Caesar the ape leader, India has strongly influences on the film. The actor says that the character of Caesar was inspired by the leader of the Indian independence movement, Mahatma Gandhi. 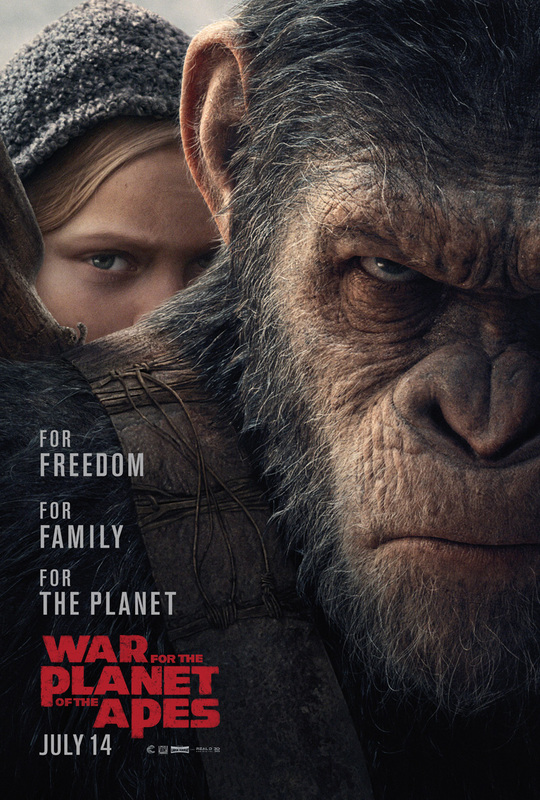 Check out War For The Planet Of The Apes Official Website and Facebook Page! War For The Planet Of The Apes is out in cinemas on 13 July 2017. *Disclosure: Invitation by 20th Fox Century. No monetary compensation was received for the movie review. A great review. Honestly I haven’t seen this movie as I like to see more of comedies and romantic stories. But for sure this is for my husband. He will love it. I saw the first movie in this trilogy and it was good! We really liked the previous Planet of the Apes and can’t wait to see this one. Thanks for the heads up! I think my son would like this movie, not sure my daughter is ready for it yet though! I’ll have to have a one on one day with my boy to see this… sounds like a good one! I’m looking into it and I couldn’t find the spam! I’m using iPhone too and wonder if it’s convenient for you to screenshot and let me know what the spam is? Thanks for sharing! My parents are in the US and went to see this with my aunt without asking me. I was a bit teed off. I asked why they didn’t ask me to go and she said that I know I don’t like these type of movies. All I could do was laugh because I knew she was right couldn’t believe I got upset about not being asked knowing I would pass. They did, however, enjoyed the movie! What a great review! I love this movie and I can’t miss it! It’s amazing how far along CGI is coming. I wasn’t planning on seeing this one either, but I may after reading this. This wouldn’t be my go to movie. I like more of a comedy or romance movies however i will give it a look. It seems interesting.